Why should I hire a pool service professional is one of the questions we get asked quite regularly. 1st Call Jupiter Pools located in Jupiter, Florida provides a quality swimming pool service to our clients and we understand that owning a swimming pool is a big expense and when you add to that the cost of pool maintenance you are adding to the cost. However, many pool owners find that they spend more money if they take on the pool service and maintenance on their own. Also, if you do your own pool maintenance you need to find a place to store the chemicals and cleaning equipment and you also have to invest in all of the cleaning equipment and chemicals up front. Having proper pool chemistry is important to the viability of the pool itself and to keeping the pool water safe for those who swim in it. When you’re a new pool owner, getting the pool chemistry levels “just right” can be frustrating and may lead to your adding chemicals, then needing to add water, then more chemicals –it is a delicate balancing act. Working with a swimming pool service assures your pool water is clean and bacteria free and that your pool equipment and the pool itself will be safe and healthy and that you can protect your investment. Testing your swimming pool water regularly is not only important for pool safety, but maintaining an optimum swimming environment will also prevent damage to your custom swimming pool and swimming pool equipment. To help you better understand the importance of testing your swimming pool water, we’ve put together a blog post to address some of the questions related to pool water quality, testing and maintaining a healthy swimming pool. One of the questions we often hear from our customers in Jupiter, Tequesta, Jupiter Island, and the surrounding areas of Florida relates to how often a homeowner should test the swimming pool water. Optimally, one would perform pool water testing each day. Realistically, especially in the long, hot days of summer – testing your swimming pool water two to three days a week will help ensure an optimum swim environment and a long life for your pool. Customers also often wonder if there are “best practices” for performing tests to measure and maintain swimming pool water chemistry. Testing first thing in the morning – especially if you have been experiencing chlorine issues – is important as chlorine burns off during the day. Also, the water sample you get for testing purposes should come from 12″ – 18″ below the swimming pool surface and run your pool system for around an hour prior to obtaining that sample for more accurate readings. Ask most people about swimming pool water quality and they will mention chlorine. What they don’t often understand is the importance of pH when it comes to maintaining a healthy pool. Low pH will cause damage to swimming pool equipment, damage the pool liner and irritate swimmer’s eyes and mucous membranes. High pH makes swimming pool water cloudy, has a negative effect on chlorine disinfection, causes lime buildup and irritates the skin of swimmers. What is a healthy pH level for both swimming pool water and swimmers in your custom swimming pool? 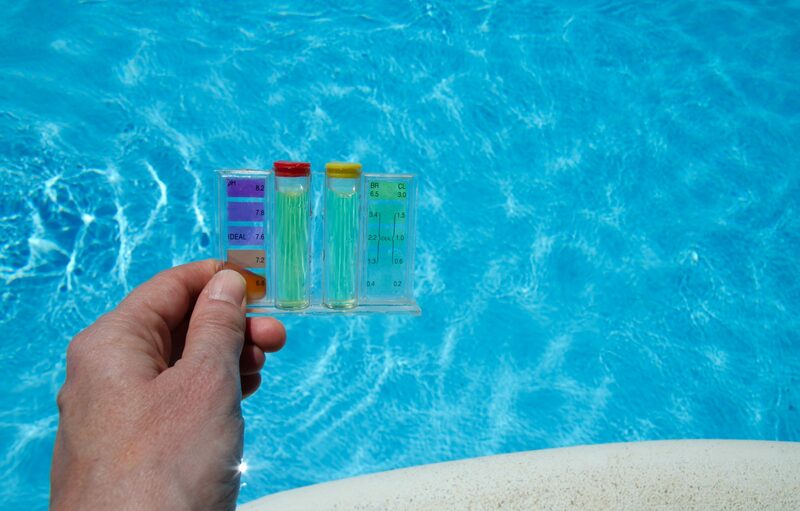 If you search for testing your swimming pool water for pH, you will get a range (albeit a small range) of answers to that question. A general consensus for the optimal pH of pool water would fall around 7.4 with a healthy range of 7.2 – 7.6. Now, of course, pH is not the only thing that determines swimming pool water quality, but you can think of it as the foundation. You will also want to test your pool’s chlorine levels, total alkalinity, calcium hardness and cyanuric acid levels as well. We’ve also heard from our swimming pool customers here in Palm Beach County and Martin County with questions regarding how to test swimming pool water. There are numerous swimming pool testing types available for purchase. 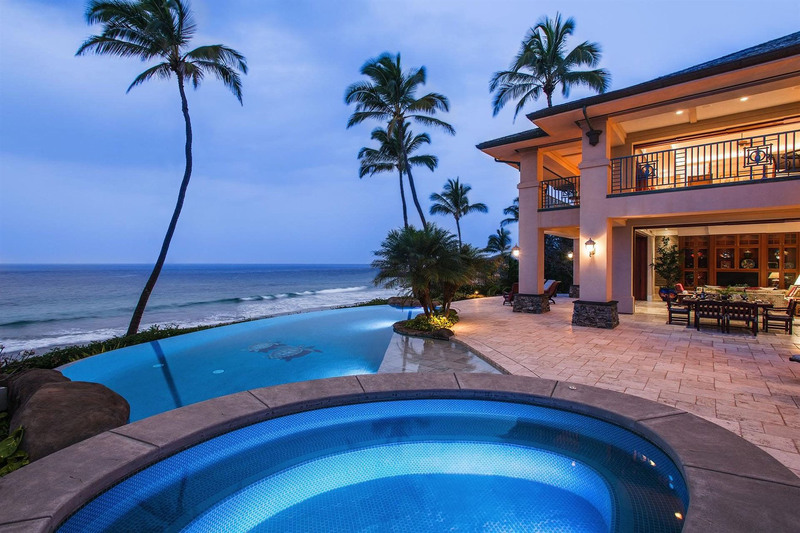 Homeowners can choose to manually test pool water with test strips, swimming pool test kits and there is also electronic testing equipment for pools. If you choose to do so, you can also take a water sample to a swimming pool professional for testing. Just remember, no matter how you do it, testing your swimming pool water is vital to the longevity of your pool, your swimming pool equipment and to the health of those swimming in your pool. Also, keep in mind that maintaining a saltwater pool is different than a chlorine swimming pool. We will cover that topic in another blog post. Until then, if you have any questions about testing your swimming pool water, maintaining your custom swimming pool or any other pool-related question, do not hesitate to contact us here at 1st Call Jupiter Pools. Saltwater swimming pool maintenance is a topic that often comes up when our swimming pool customers in Jupiter, Tequesta, Juno Beach, Palm Beach Gardens, Hobe Sound, Jupiter Island and the surrounding areas of South Florida, Pool owners are weighing the benefits of saltwater swimming pools versus chlorine swimming pools. While most homeowners considering a swimming pool with salt water understand that these pools are gentler on skin and eyes and better for swimmers with allergies than chlorinated swimming pools, they are often unsure on how saltwater pool maintenance stacks up against pools with chlorine. One of the biggest misconceptions about these inground swimming pools is that they are free of chlorine. In reality, salt water swimming pools do have chlorine in the water. The big difference between chlorinated swimming pools and pools with salt water is how that chlorine gets in the water. And this saltwater pool system makes a big difference when it comes to maintaining your swimming pool. With today’s chlorine generator technology, saltwater pool maintenance is actually quite simple. It is not, however, maintenance-free. A saltwater swimming pool uses a salt-cell system filled with salt for pool water maintenance. When water passes through a salt cell, electrolysis releases chlorine from the salt and keeps the pool sanitary. 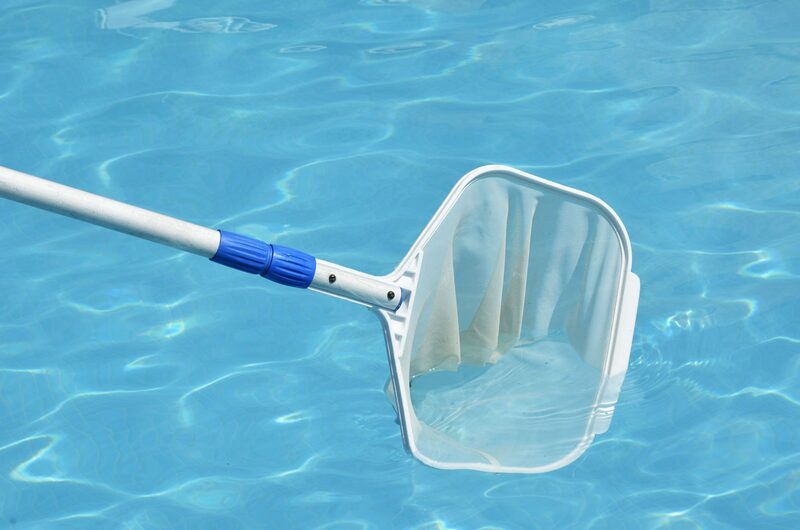 This process of continuous disinfection without the need to handle, store or add chemicals to your swimming pool water is one of the benefits of saltwater swimming pools. By producing the sanitizer in the pool water, your inground pool will continuously kill germs, neutralize contaminants and slow algae growth. While it is not a “set-it and forget-it” pool maintenance system (as you will need to add salt and ensure the saltwater purification system is operating properly), a saltwater pool sanitizing system requires much less effort to maintain water quality than traditional chlorine-based systems. So, if your swimming pool with salt water will need maintenance, what will your pool maintenance routine look like? Much of what will be required to maintain a healthy swimming environment will depend on a number of variables including: your pool usage, how well your pool system is functioning and other environmental factors. The basics of keeping your custom saltwater pool functioning properly and the water healthy include the following steps. You will need to monitor salt levels and test your pool water pH level. Much like chlorine swimming pool water, you will need to test chlorine levels, total alkalinity, calcium hardness and cyanuric acid levels. You will also need to keep an eye on your salt water swimming pool filter to ensure it is operating properly. And finally, you must clean the salt cell. Have any further questions about saltwater swimming pools or any other swimming pool questions? We’re here to help. Contact us with any of your questions you may have.